In 2015, the Political and Legal Anthropology Review is introducing a new feature, Emergent Conversations. For years, we have featured online spillover conversations that capture discussions sparked by articles in the pages of the journal. 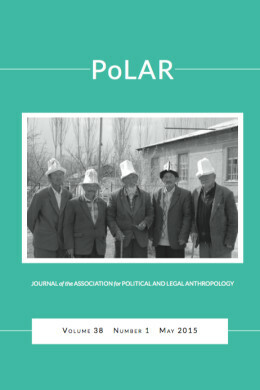 Recognizing that articles are merely textual snapshots of longer, iterative research projects, PoLAR Online now include reflective pieces that highlight ongoing dialogues in political and legal anthropology. While not yet in the journal, they are nonetheless shaping the conversations in and about the field. Part I of the 2015 series is Among the Anonymous Dead: Exhumations and the Emotive Materiality of Deceased Victims of Mass Violence, which is based on the panel of the same name that took place at the 2014 American Anthropological Association meetings in Washington, DC. Part 1 is available here. Our second installment is Reflecting on Silence and Anthropology, on an Invited Session sponsored by the Association for Political and Legal Anthropology (APLA) and the Society for Linguistic Anthropology, Silence in/and Ethnography: Cartographies of Power and Knowledge in Anthropology and its Publics, which took place at the 2014 American Anthropological Association Meetings in Washington, DC. The full conversation is available to download as a PDF here. An excerpt by the panel organizer, Natasha Zaretsky, is here. Our third installment is Being Like a State, based on a panel of the same name that took place at the 2014 American Anthropological Association Meetings in Washington, DC. An excerpt of the conversation is here, with the full article available to download as a PDF here.